When I get bad news — really bad news, not just annoyances — my first inclination is to make a big dish of baked pasta. It’s what I did when I heard my grandfather had died, and it’s what I did when I learned that a co-worker had been admitted to the ICU. It’s not the same as comfort food, really. There’s something about the process, the ritual of it, that helps me deal with the situations I’m in. What follows is my standard recipe, though it’s simple enough that can certainly be tweaked to your liking, and it feeds two-to-four people (or one person in a truly foul mood). Let me know what your bad news food is in the comments below. Start by boiling half a pound of pasta in salted water; I recommend using something tubular or hollow. Use the directions on the box to time the pasta for what they say will produce al dente results. In another pan saute some chopped mushrooms in olive oil until brown and crispy, season with salt, and add the juice of a lemon. The lemon flavor will add an interesting element to the finished dish. Pre-heat your oven to 450 degrees. Add a 14 oz can of tomatoes to the mushrooms and season them with salt, then continue to cook over medium heat until everything is cooked through. Combine the pasta and the sauce, and if you have some ricotta cheese you can mix that in too (though it’s certainly not necessary). 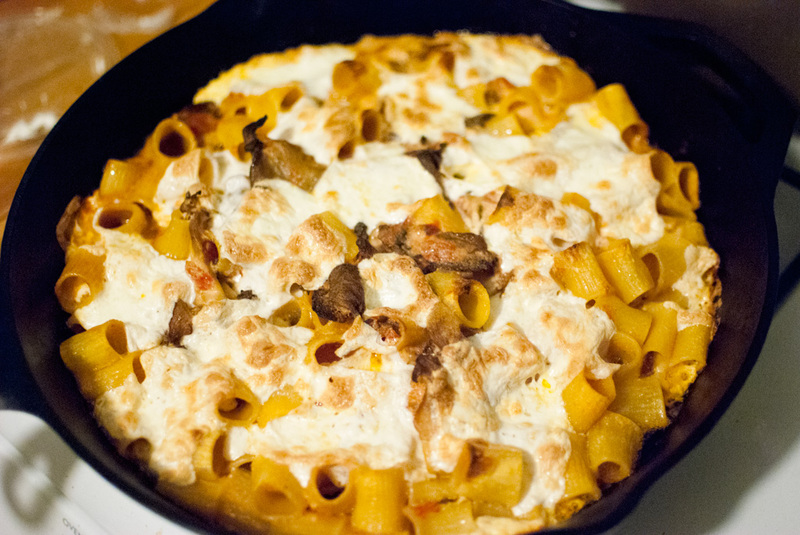 Pour the sauced pasta into an oven-safe pan, and top with chunks of fresh mozzarella. Please, do not use the shredded processed “mozzarella” you find in plastic bags at the grocery store, go out and find fresh mozzarella. It’s really worth it. Put the whole dish into the oven and let it go for about 45 minutes, or until the cheese on top is crusty and brown. The most important step: let it cool for a while before eating! Or you will burn your tongue.